The Texas Senate’s Health and Human Services Committee, like politicians in several other states, is taking advantage of the heavily edited videos by the anti-abortion Center for Medical Progress which purport to show Planned Parenthood illegally selling fetal tissue. 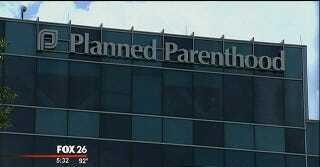 At the same time, a Planned Parenthood in Houston says they believe they’ll be the subject of the CMP’s next video. Two people “fraudulently representing themselves” as research executives and providing fake California driver’s licenses toured the Planned Parenthood facility in April “under the guise of discussing tissue research with our clinic research staff,” said Planned Parenthood Gulf Coast spokeswoman Rochelle Tafolla. Texas is a particularly smart case to peddle this particular brand of anti-abortion wares, given that their politicians have long tried to make it as hard as possible for Planned Parenthood to operate in the state, repeatedly knee-capping family planning funding as a way to hurt them (and every other family planning provider in the state). The committee will meet to examine the business practices and regulatory structure of Planned Parenthood affiliates in Texas, and to investigate whether state or federal laws are being broken by Planned Parenthood and/or its affiliates in Texas in regards to the donation and/or sale of fetal tissue. The committee will consider recommendations to strengthen regulations on abortion providers, including further restrictions on the sale of fetal tissue by these entities. The group behind this fraud has executed 10 separate attack campaigns like this over the last eight years in an effort to ban abortion and block women’s access to care at Planned Parenthood. It also, as Planned Parenthood detailed in a letter last night to Texas State Senator Charles Schwertner, Chairman of the Texas Senate Health and Human Services Committee, appears that the group may also be working behind the scenes with the Texas Senate Health and Human Services Committee, by privately providing them with the video illegally obtained ahead of a public hearing scheduled Wednesday. Dawn Laguens, Executive Vice President of Planned Parenthood, released the following statement on the hacking, saying they’ve notified both the Department of Justice and the FBI. “Planned Parenthood is the most trusted women’s health care provider in this country, and anti-abortion extremists are willing to do anything to stop women from accessing the reproductive health care they are seeking. Extremists have broken laws, harassed our doctors and patients, produced hack videos, and now are claiming to have committed a gross invasion of privacy — one that, if true, could potentially put our staff members at risk.